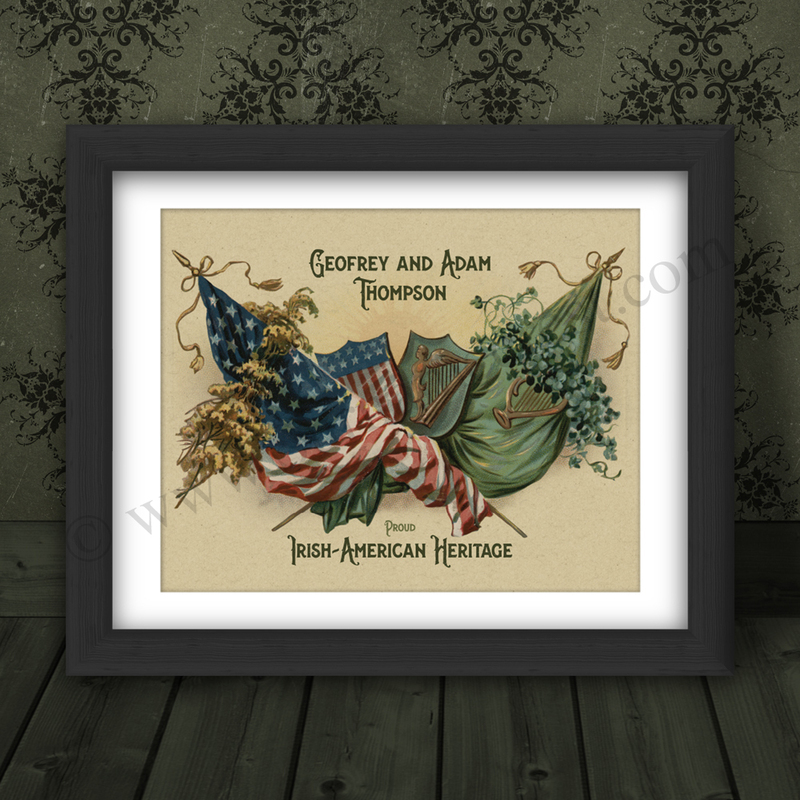 Irish Shamrock with American and Ireland Flags. Personalised 10 x 8 Print. 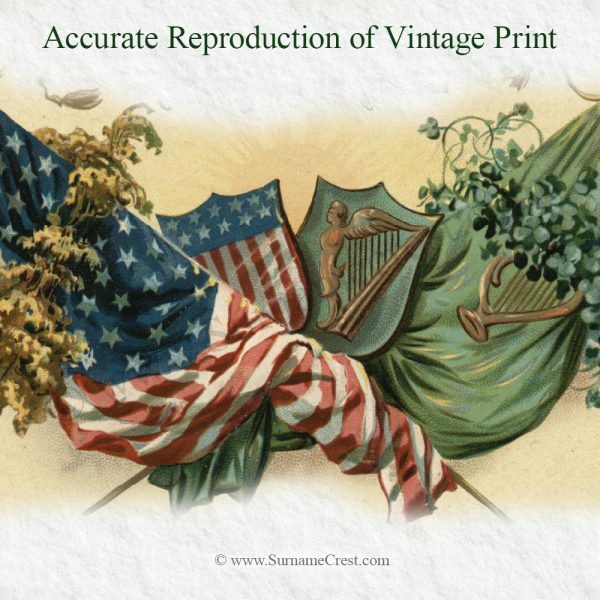 This is a personalised reproduction of an original vintage print, printed on Italian made Parchment. This image is ready for framing: print is 10 x 8 inches with a 12 x 10 inch mount surrounding it. Add your Family Name or an Individual name to this vintage print. The name appears in a traditional typeface – echoing the era of the original print. The image we have reproduced from a scan of an original Irish themed print from the 1800’s -early 1900’s. 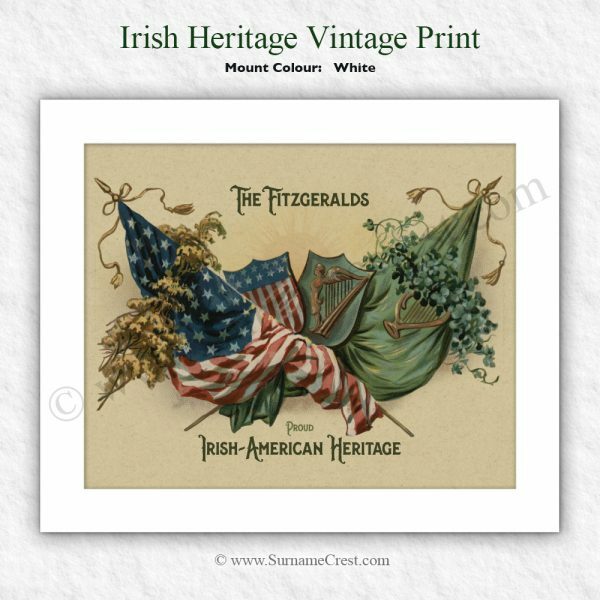 It is wonderful to think that your early Irish ancestors that travelled to the States and elsewhere – probably viewed and admired the very same image all those years ago. The image is printed as it was in the original with any flaws, colour shifts and blemishes faithfully copied so to add to its authenticity. These give the image the very same character and look as in the early 1900’s. 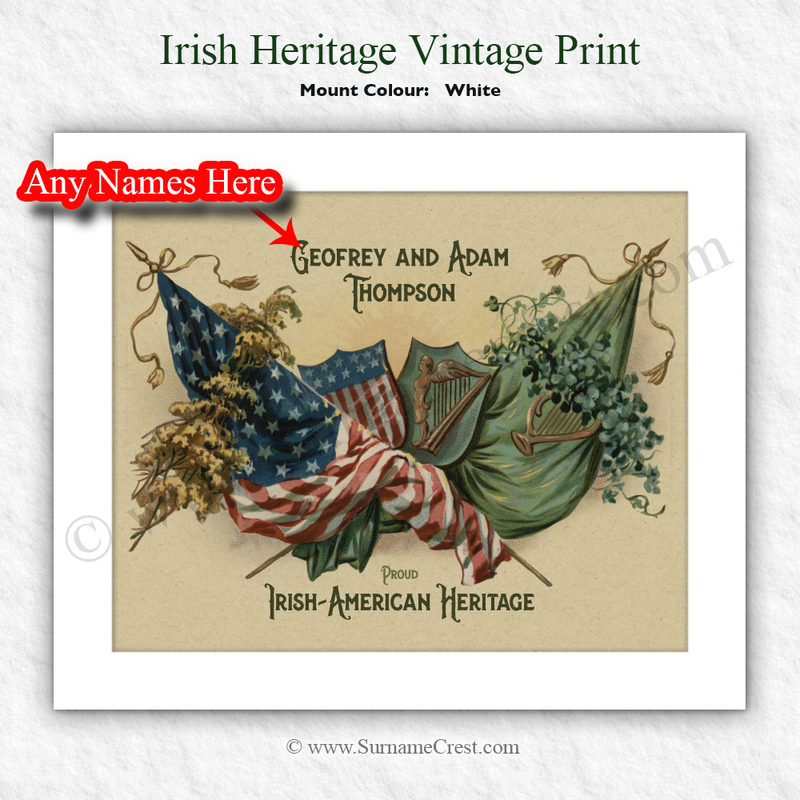 This print shows the flags of America and the Irish flag together with the wording – “Proud Irish-American Heritage”. The image would have delighted and thrilled them, reminding the of “the old country”, Ireland. Our prints use special archival inks which are fade resistant and are of museum preservation standard. 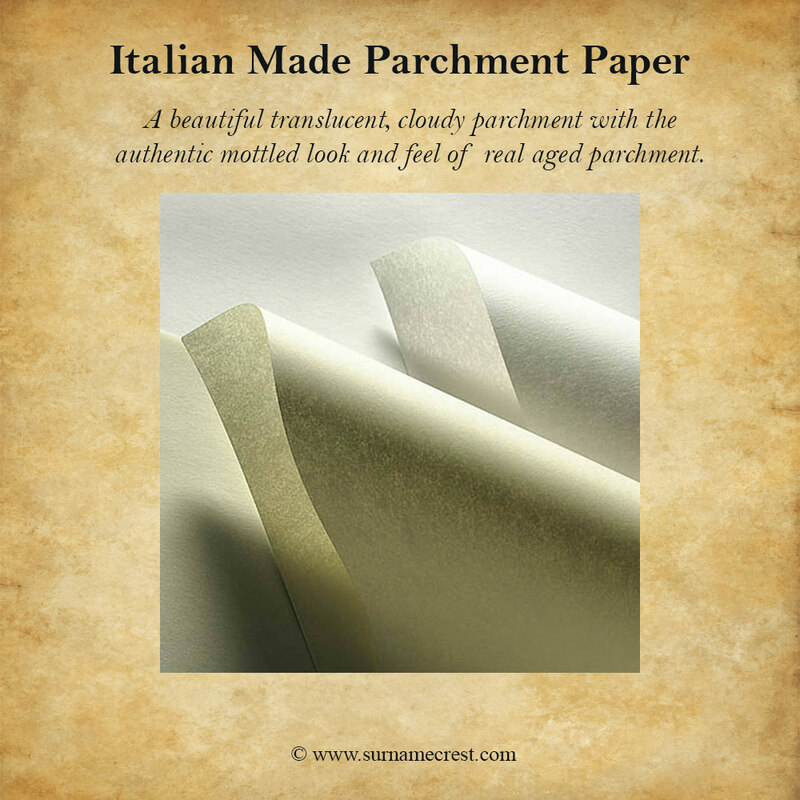 The paper we use is museum quality Parchment – a beautiful translucent, cloudy paper. It has a crisp taut surface, mottled look and hard feel you would expect from an actual traditional sheet of old parchment. 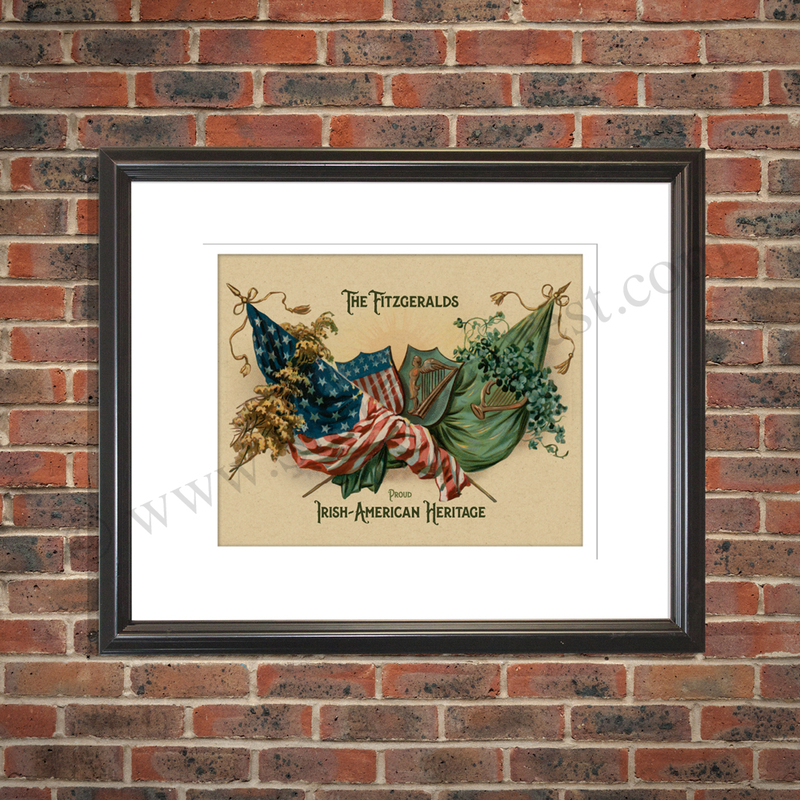 The image has a white mount (Matting) and is ready for framing in a standard 12 x 10 inch frame or larger. This is a wonderful Birthday, Christening, Family Friend, company or any other celebration gift. Our ready to frame prints are individually wrapped in cellophane and shipped in bubblewrap and protected cardboard. The print is good quality, strong rich colours on lovely paper and smooth. The size fitted perfectly into the frame we bought. My Irish American friend loves the beautiful presentation and that it was Irish made. I loved this picture – it helps tell the story that so many of us Irish-Americans share. It beautifully encapsulates the mixture of both worlds—old Ireland and America. The paper its on, is beautiful. The packaging it came in – with the old Irish Post card – was absolutely beautiful. Eoin and all at SurnameCrest really showed they care about their customers. It’s perfect!! I’m so happy that I came across an Irish company that knows how to celebrate my Irish heritage. My great, great great grandfather came from County Kerry – and we are so proud of our Irish background. We travel over every other year, staying with our many cousins in “The Kingdom”. Thanks for your great product and great service!! I love family history and I am so happy with my Irish Heritage print. I am proud to be Irish American (although you wouldn’t guess from my name). My grand mother was from Sligo and emigrated to Boston in 1896. She taught me all about the Irish. This print reminds me so much of her, Thank You! A beautiful Print with the Irish and American Flags. The print reminds us of the rich Irish cultural heritage of song, music, and poetry infused the hopes and dreams of new generations to come. This print is now proudly on the wall of our living room. Excellent Product. I grew in the New York, second generation Irish, and could relate to the imagery – was very touching. I hope there are more of this series of prints coming. Bought this for an American-Irish friend who will love the Irish associations. The print is beautifully presented. Overall a nice gift at a good price. I purchased this print for my mother, as I thought she would like it. She LOVED it! She went on about how much it reminded her of her upbringing – the stories she heard at home from her parents. Her parents came over from Ireland when they were young, settled and worked in the Bronx. I can’t wait to recommend this to other people. 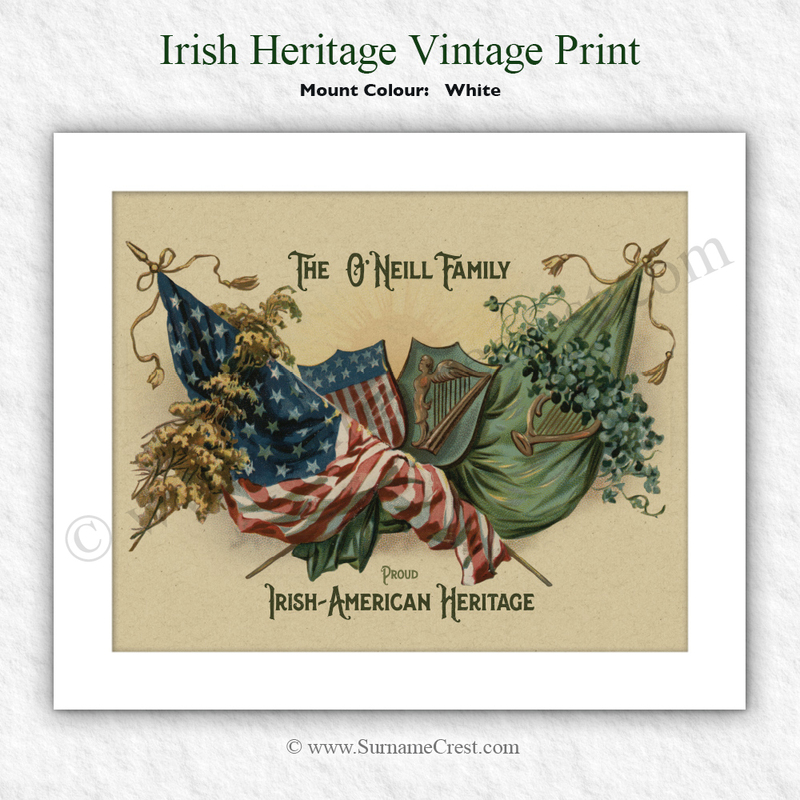 I gave this Irish Heritage print to my mother who grew up in an Irish family that emigrated to Victoria in the 40’s. She loves it! Its proudly displayed in her kitchen – she says its the “heart” of the home. This Irish print warmed my Irish heart! It brought back so many memories of my grandad singing at our family gatherings growing up. If you’re looking for a unique gift for someone who has any Irish blood, or can just appreciate a good picture, rich with details, that will make you cherish where we come from, and the family traditions that help shape who we are;- give them this print! This is a beautiful, vivid print. The vintage image gives texture to the Irish immigrant experience and what it must have been like at that time in the 1800-1900’s. 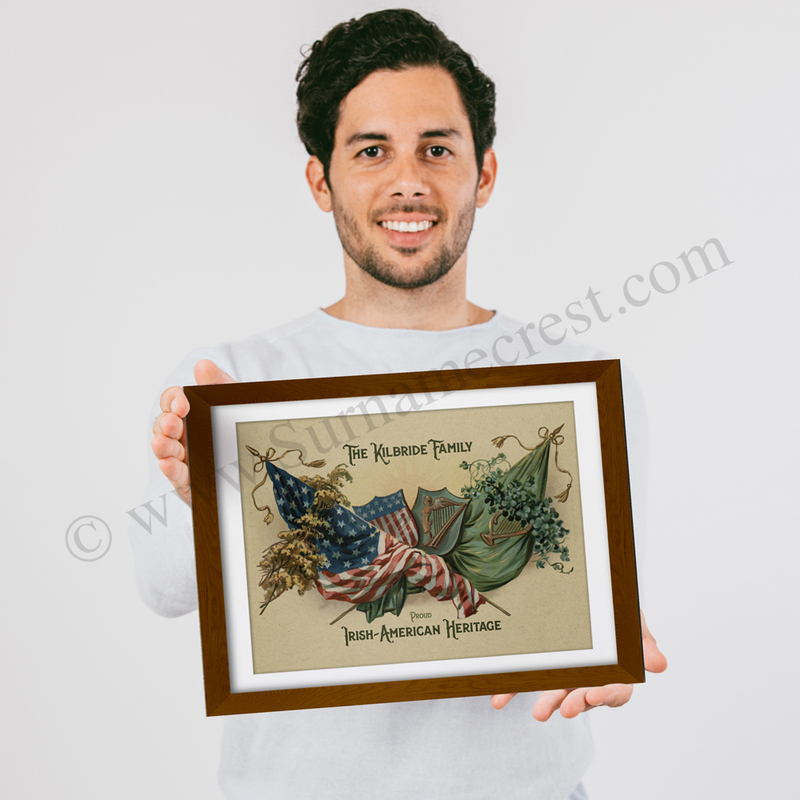 It evokes feelings of their love for their old country, and their newfound home in America. I’m going to get more of these prints for my children, and as St. Patrick’s Day gifts this year. International customers find that the cost of our products, together with the cost of International delivery – is STILL CHEAPER than similar products from their local retailers. We deliver just as fast, and we don’t compromise on the quality of our products!